HOW DOES ELCI CONNECT ABUJA & PERTH? As you may already know, most ELCI pieces are made in Abuja, Nigeria. A few have been made in Rwanda, this being the Sampa Currents dress and the items that were included in the Elci x Omega Kids collaboration. With that being said, questions such as; "Why Nigeria? ", "How does it work? ", "The tailor(s) making the clothes, what type of conditions and circumstances are they in?" all come up. ELCI is going to take you through a step by step journey on how they are connecting two cities that are very far apart, geographically, but the two worlds have seemed to effortlessly cross. 1. Who are the designers or the creative minds behind the collections, concepts and look books? In other words, who are the people writing this article. The creative minds behind ELCI are Cecilia Ekeng and Linda Iriza. Together they come up with multiple designs and over a course of either a week, two months or 3, they finalise the designs. While coming up with designs, the things that they keep in mind are: modernising traditional African print designs and finding prints that will suit a range of skin tones. Cecilia and Linda met in High School, and they had dreams of becoming pilots but now they own a business together in a completely different industry to what they had imagined in year 8. 2. What happens to the designs? Who makes the pieces and why are they made in Nigeria? We are lucky enough that we get to work alongside Mrs Joy, She runs her own small shop in Abuja. All the pieces are made with love and joy (get it!). Elci has opened another door for Mrs Joy to continue doing what she loves and to keep growing her small business. It is Elci's dream to continue to connect with different creatives all across Africa and help them build and sustain their already existing small businesses. ELCI shares all the designs with Mrs Joy and she adds on ideas on how to perfect the final piece. It's all about team work! Additionally, Mrs Joy receives a wage that she desires because she's the one who sets her own prices. From the price she sets, ELCI works from that to set the final selling price for the piece once they're available online. 3. Where are the materials sourced from? All the pieces are sourced from various markets in Abuja. This is one of the most time-consuming exercises, as whilst Cecilia and Joy are shopping for material, Linda has to also stay active to give her input on whether or not the prints are perfect for the designs they're working on. By purchasing from local markets and sellers, this is also another way ELCI is directly supporting very small black owned shops in Abuja. We hope to keep doing this and the more collections released the more impact ELCI is having in Abuja. Elci's Vision, is to eventually turn into a platform for different African designers to showcases and sell their clothing, art and much more. More specifically, for African designers who source their material from Africa, who make their pieces in Africa and those who have a goal to impact their small towns or countries. Simply because the impact that a collective of African designers and creatives can have on the African fashion and arts industry is large. 4. What impact is ELCI having in Perth? 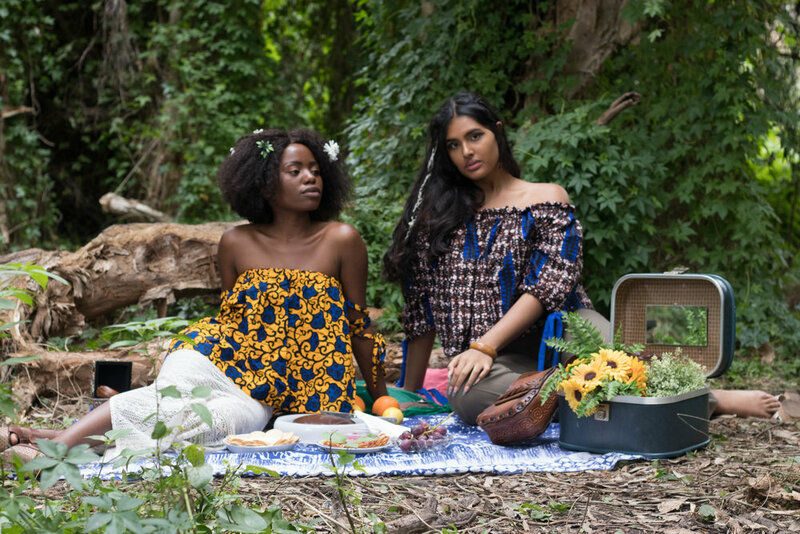 Elci works with local Perth upcoming women of colour photographers to help bring the lookbook concepts to life. This opens up a very collaborative environment, where both the photograph and ELCI are wanting to showcase their best work. In a way, the work of Mrs Joy is opening doors to the various photographers ELCI works with in Perth. As without the ideas of Ekeng and Iriza being brought to life by Mrs Joy, these shoots wouldn't take place. Additionally, ELCI wants to turn Soul Alphabet into an annual event. Where every year all profits being made from Soul Alphabet (an event that promotes people of colour and their creativity), will go towards a charity that transforms the lives of; women, children and families in third world countries. At every event, ELCI also showcases their collections pieces on runway, and this is an event that means a lot to Mrs Joy. As her work is essentially being viewed and once again worn on the opposite side of the world.